One of the finest of all French bobbin-laces, the world-famous Valenciennes, was first made at the town which gave it its name, towards the end of the reign of Louis XIV. It originated apparently at Le Quesnoy, a town which was one of the lace centres under Colbert's ordinance of 1665, but where a lace manufacture of some kind had been established prior to ibis date by a colony of Antwerp workers under the leadership of a Mlle. Badar. 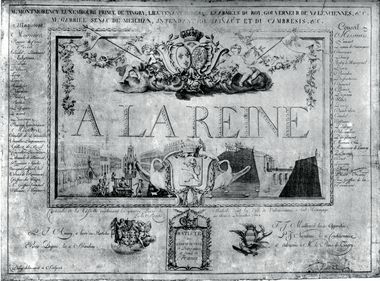 There is no definite record of the transfer of the lace industry to Valenciennes ; the date can be only inferred from the fact that nothing is heard of Le Quesnoy as a lace-producing centre after the death of Louis XIV, while just about the same time Valenciennes comes to the front with lace markedly Flemish in pattern and texture. 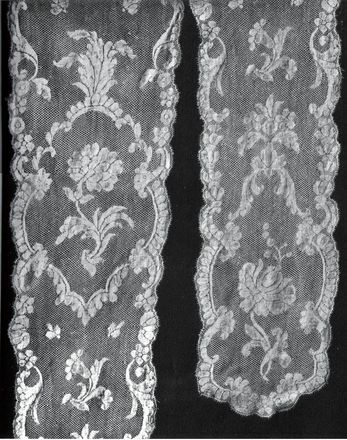 The most noteworthy characteristics of early Valenciennes lace, are the flowing scrolls and graceful, although purely conventional, flower motives of the design, and the mixed reseaux, two, or even three, being introduced into a single example of lace, and these so closely inter­mingled with the pattern as to produce a rather confused, although far from unpleasing result. Of these various reseaux, by far the most effective is the fond de neige, ceil de perdrix or snowflake ground, similar to that of Argentella lace, but, of course, worked with bobbins instead of with the needle, in which each of the irregular, spidery meshes has a dot within it. Shortly after the accession of Louis XV to the throne in 1715, the lace-woikers within the town of Valenciennes adopted a new and regular reseau with a lozenge-shaped mesh formed of four threads plaited throughout, the threads being reduced to three at a later period. The inventors of this clear, open but rather uninteresting ground called the new style of lace, vraie Valenciennes, dubbing the older kind, with the mixed and fanciful reseaux, which continued to be made in the districts round the town, fausse Valenciennes. This strange and scarcely justifiable distinction has led, not unnaturally, to some confusion. Both types of lace, vraie and fausse, so called, were made on the pillow in one piece, that is to say, pattern and ground were worked at the same time with the same threads. The toile is exceptionally close and even in old Valenciennes, and there is no cordonnet. The extraordinary fineness of the Flemish thread used was mainly, if not entirely, the cause of the beauty of the texture of the lace, but it has been asserted that the peculiar conditions under which vraie Valenciennes was made, namely in damp cellars so dark that the unhappy workers usually went blind before they were thirty, had something to do with it. But this may be regarded as a piece of fiction, probably originating with the town-workers, who also asserted that it was impossible for lace of the best quality to be produced without the walls even if made by the same worker, with the same thread and on the same pillow ! Innumerable pins and a great number of small, light wooden bobbins were necessary in making both varieties of Valenciennes, and the lace was worked in sections about eight inches in length, which were joined on completion. Altogether, the process was a very slow one, and this, combined with the costliness of the fine Flemish flax-thread, made Valenciennes lace an exceedingly expensive luxury. It took ten months, working fifteen hours a day, to complete enough lace, three inches wide, for a pair of ruffles which would sell for 4,000 livres. The Valenciennes trimming of one of Madame du Barry's pillow-cases cost 500 francs, and her lappets of the same lace, over 1,000 francs. Yet, strange as it may seem, Valen­ciennes never ranked among the most aristocratic laces and it was seldom worn in full-dress. About the middle of the long reign of Louis XV a change occurred in the patterns of fausse Valenciennes, and the scrolls and conventional flowers and leaves were partly superseded by designs of natural flowers —tulips, carnations and roses—beautiful enough in themselves, but neither as graceful nor as appropriate as their predecessors. But, although the patterns may have lost a little of their charm, the quality of the fabric was at its very best about 1740-50, and only slightly less good from that time up to 1780. It shared the fate of the majority of French laces at the Revolution, and, less fortunate than some of its fellows, it was never successfully revived, although as late as 1840, a few, very aged workers were found able to make a head-dress of vraie Valenciennes as a wedding-gift from the city to the Duchesse de Nemours.